A100 + Soligor 400mm/6.3 (also Spiratone & other related brands) - T4 mount lens in M42 mount with M42-MAF adapter. I first learned of the Soligor 400mm from this guy's blog post. Sorry no corner crops (corners fell outside the plane of focus anyway, and ripples in the water make it hard to determine sharpness at the left & right edges). Contrast in this image is poor due only to overexposure, my fault. CA is heavy when shooting wide open, as you can see. Stopping down to f/11 helps significantly. I'm not sure I have a sense yet of the sharpness or softness of images produced with this lens -- its heavy, all-metal construction and its length, and its slow 6.3 aperture, make it difficult to get sharp shots without a tripod, and then, even with a tripod, focusing is tricky. I suppose a chipped adapter (SSS, focus confirm) might help. Tripod shots will follow -- after I take a few more & get them uploaded. Hello, working on getting a T4 (interchangeable) mount lens to M42, then an M42-->MAF adapter to get the lens on my A100. The T4 M42 mount I bought has the very nice feature of a manual aperture stop-down switch, like what you find on some M42 lenses, great for stop-down metering/shooting. Here's the problem: the pin on the T4/M42 mount is slow in opening and closing the aperture blades. This causes the aperture to behave like there is oil on the blades (there is no oil on them, as confirmed by using the T4/MD mount & just flipping the aperture open & closed). So the aperture pin and/or manual stop-down switch is/are not snappy. Can I oil the aperture pin and/or stop-down switch? If so, what kind of oil do I use? Or, conversely, should I degrease the pin/stop-down switch? Updated with the beginnings of a review. Hmmm, thats not easy. I do not have real experience with that. Is it possible to take a look inside the unit where the slow-moving-pin is? Maybe you can see if there is dirt making it move slowly. This could also be resinifined oil or grease. That would be my idea. I would try cleaning it as detailed as possible at first. And then see if there is grease needed (I don't think oil will suit). My M42 lens has some parts with grease upon it. With getting older this grease of course is not getting better...so it might be time at your unit to "refurbish" or service it a little. If you think the issue is within the adapter, you might check this link regarding how to open it, and what is inside. However, I am surprised to hear that it might be the adapter which is slow, as mechanically it is very simple, and there is no grease at all within it. Are you sure that it is the adapter and not the lens which is slow? You might check it by manually actuating the aperture pin on the lens without the adapter. There should be no oil on the aperture and aperture actuator mechanism. Alternatively, you might also want to permanently lock the adapter in stopped down position (like I did), especially if you are only using it with this lens. Anyhow, the only aperture stops which might be interesting on this lens are 6.3, 8 and 11, so at worst you would focus "wide" open, and count up to 2 aperture clicks to stop down. @rowivision - thanks for your advice! I agree, I suspect it is just some dirt buildup or something of the kind. I will follow Gabriel's information, and open up the adapter. You might check it by manually actuating the aperture pin on the lens without the adapter. Yes, already checked, and it is fine. It also works fine (opens/closes freely) with a Minolta MD adapter fitted. The problem only occurs when the M42 interchangable mount is fitted. 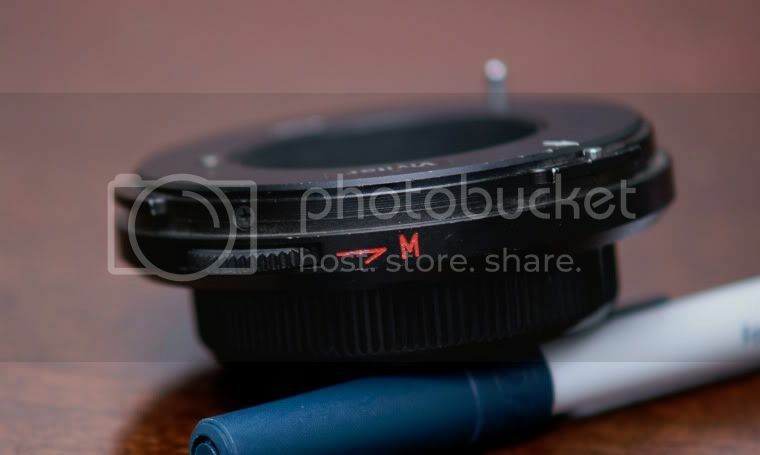 I should also mention, that the actuation is slow regardless whether you press the aperture pin or the M switch, and you can tell it is slow even with the mount completely removed from the lens, meaning the M switch and the aperture pin feel stiff. Thank you for the link. My T4-M42 mount seems to be the same. If I get a chance in the next few days, I'll open it up. Perhaps it just needs cleaning. Yes, that is the lens. Quite an awkward beast, isn't it? Very true. Using the M switch is awkward. Finding the fix for the M42 adapter is more a point of curiosity, than an actual need. Very likely, even if I do fix the adapter, I will still use your technique of locking the adapter in the stop-down position. Thanks again for your help!